The Mate 20 comes with an LCD screen and a 4000mAh battery. The screen is slightly larger in area than that of the Mate 20 Pro, who in turn uses an OLED screen, but also features a slightly larger 4200mAh battery. The Kirin 980 of both phones should provide great efficiency, although I have to note that my units of the Mate 20 Pro seemed to have a worse binned SoC, as active system power consumption (normalised for screen and idle) in SPEC was about 8-9% higher than on the Mate 20. In the web browsing test, we see the regular Mate 20 post some new record battery life results, with a staggering runtime of 13.5h. Here we finally see Huawei replicate the results of the Mate 9, which similarly had a very efficient screen. The efficiency of the SoC also augments the phone above that of other devices. On the Mate 20 Pro, we see the previously discovered screen panel issues come back to haunt it. Even though it has a larger battery and a smaller screen than the Mate 20, the more expensive phone fares worse off in the test. Unfortunately the large base power handicap of the phone along with slightly worse luminance efficiency is the main cause of the results. In regards to the Mate 10 results: The actual battery life of devices on the stock firmware should be better, unfortunately I haven’t been able to get to get back to this version as my units have a variant that unlock the memory controller to its full speed (and reduces battery life). 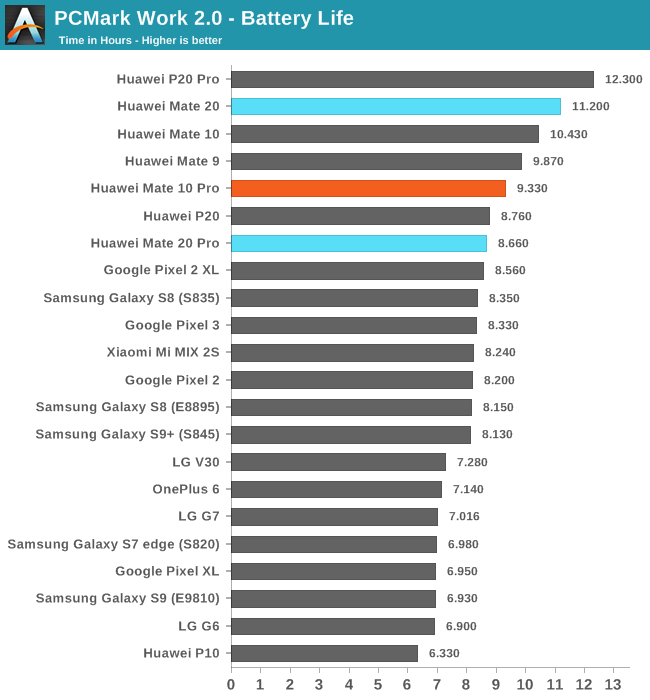 In PCMark, we see a similar regression on the part of the Mate 20 Pro – the regular version is achieving excellent results. 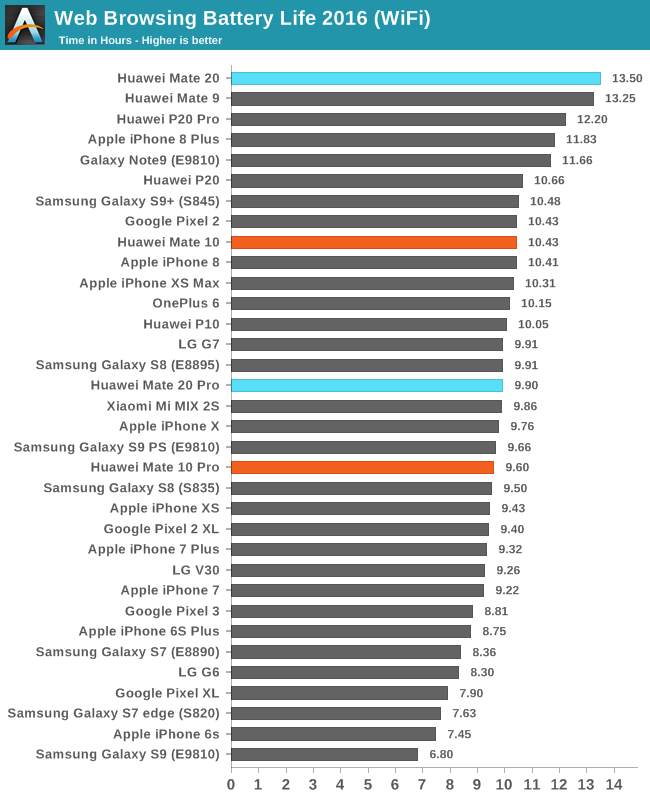 Here the test is favourable to OLED devices, as evidenced by the P20 Pro leading all our results, however again this increase base power consumption of the Mate 20 Pro costs it a lot of lifetime which ends up it having much reduced battery life compared to where the SoC and battery capacity should have been capable of. The Mate 20 is just an outstanding device and is currently showcasing absolutely leading battery life. Most devices with such runtimes are lower or mid-range phones with large battery capacities. In the high end, the Mate 20 is essentially in a tier of its own as it achieves this excellent battery life result while also showcasing the best performance of an Android device. The Mate 20 Pro’s result and conclusion is a bit more muted. Its battery life isn’t bad, but falls short of expectations. Here the 4200mAh battery serves as no more than to just compensate for the inefficient display.